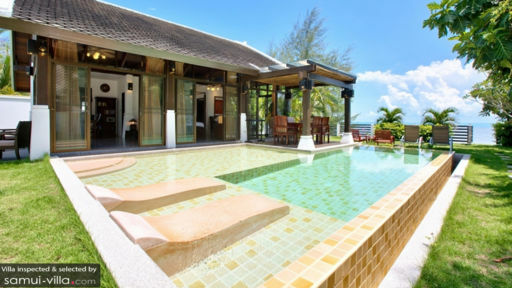 Villa Emerald Sands is a private tropical beachfront paradise, along Bang Po Beach. Appropriate enough, this villa possesses a lush frontier of green foliage that fuses well with its innovative architecture. Take a few steps out of your fence and relish your seemingly private beach experience due to the tranquil nature of your villa location. This villa consists of two distinct buildings, inspired by different generations, where you can concurrently reminisce the beauty of the luxurious olden days’ house structures and appreciate the chic-modern days’ innovation in house structures. There are 4 finely appointed air-conditioned bedrooms in Villa Emerald Sands. The master building is home to 3 bedrooms which features a king-sized bed and a stunning ocean view. Enjoy a luxurious private en-suite shower room with a private jacuzzi amongst tropical stone decor, under a transparent roofing to never miss the warmth of the sun. The other building is home to the master bedroom which features a king-sized bed and is merged with the dining and couch area, bragging a full ocean view and a direct access to the outdoor pool. The apparent lush greenery surrounding the outdoor area of this villa takes you to a slice of a tropical haven. Take a dip in your private swimming pool, or sunbathe on the sun loungers along the pool terrace. You can also enjoy an alfresco dining on the dining table that stands just beside the swimming pool, along with the serene ocean vista. A few steps away from your private pool will take you to the beachfront where you can enjoy the natural beach waters, and the warmth of the sand beneath your feet. Have a kayaking experience with the complimentary kayaks in the villa, just make sure to stay safe and have fun! The master and modern-inspired building in Villa Emerald Sands ensures that you will not forget to be captivated by the beauty of nature. It’s transparent roof design in the living room will constantly brag of either the jolly sunrise, or the elegant night skies of Koh Samui. The living room is equipped with a huge couch area and a flat screen TV for your lazy indoor days. 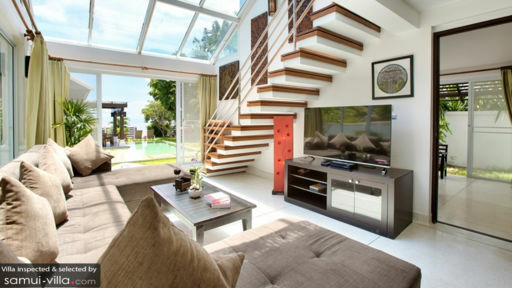 Take the modern stairway with oriental art pieces that stands by it, and you will be led up to a dainty loft. The loft is an ideal area for when you want to be closer to the beautiful sky or just want to overlook your living area, the exterior foliage or catch a glimpse of the sea while in the comfort of your couch. A kitchen equipped with modern appliances such as a oven, a fridge and a microwave is available for your utility as well. The hues of brown that the other building is designed with, will take you back in time as you spend your holiday under an olden day inspired architecture. The living area is ornamented with elegant artefacts and classic furnitures such as a wooden bookshelf and an ancient-inspired closet. This one-floor beauty merged it’s air-conditioned bedroom space with an internal dining table, a dainty couch area and a TV satellite. The living area is surrounded by glass-sliding panels, allowing unobstructed view of your outdoor pool area and the ocean right beside you. Villa Emerald Sands offers a 5-star guest service experience from the leading service company in Samui Island. Connect with your Guest Manager for information on how and where to get around the area. Services such as privates chefs and in-house massages are available upon request. On top of the services, enjoy free WiFi throughout the villa to enjoy uploading your holiday photos for your friends to see! 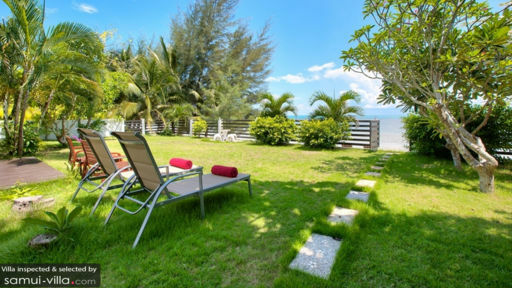 Should you already get enough respite in Villa Emerald sands and it’s beachfront, Bang Po beach offers a wide range of restaurants at night where you can try local and European cuisines. Just 5km away is the traditional Nathon fishing harbor or the famous night bazaar in Maenam, thus making it’s location versatile for a calm or an adventurous holiday.